I wish I could take credit for this recipe – the best new thing I’ve tasted all year – but the credit actually lies with two of my favorite chefs in Seattle: Philippe Thomelin of Olivar, and Joseba Jiménez de Jiménez, formerly of Harvest Vine and now playing around at Txori. On the night I first tasted chorizo caramel confit, I had just finished an excellent meal prepared by both chefs on a special evening at Olivar. I happened to be sitting with Jay of Gastrolust.com, and Joseba came over to say hello. Of course we praised the meal, and I jokingly asked, “But where was the chorizo?” Joseba disappeared into the kitchen and emerged a minute later with a plate of sticky-sweet chorizo atop crostini. They were unbelievable, and I’ve dreamt about them ever since. Apparently, Philippe and Joseba had hand-made the chorizo earlier that day and had been cooking slowly in caramel. Philippe generously shared his simple recipe, which I’ve recreated here using store-bought chorizo. Pour the sugar and water into a medium skillet with high sides (taller than the chorizo is thick). A non-stick skillet makes for easier cleanup. Do not stir the sugar and water together, just make sure all the sugar is wet. Over medium heat, bring the sugar water mixture to a soft boil. Stir in the butter until melted. Reduce the heat to a low simmer. Add the chorizo and continue to simmer for 10 minutes, up to 3 hours. The longer it cooks, the more flavorful the caramel will be. (Optional, for serving) Butter one side of thin baguette slices and toast in the oven or on a skillet. 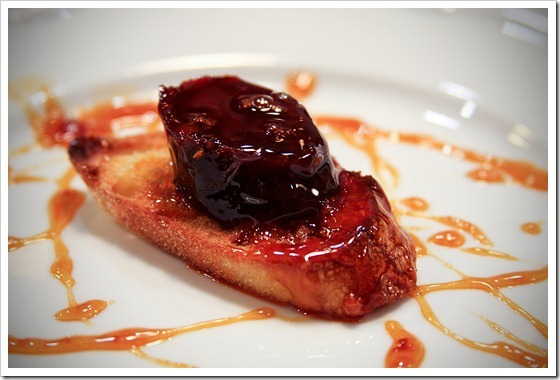 Place each piece of chorizo on a piece of toasted bread and drizzle with the caramel sauce in the pan. Or, dump the whole pot into a mason jar and serve with bamboo skewers. This is my new favorite dessert, and a dish that I’ll serve often at cocktail parties. If you’re interested in hearing more about the wonderful dinner at Olivar, Jay has a great writeup on his blog. And, many thanks to Frantic Foodie Keren Brown for organizing the dinner! wow, thanks for sharing this. I am craving the chorizo now. Beautiful recipe with the combination of sweet and savory. Such a rich flavor profile. These look amazing – I am recipe shopping for the holidays and now I am going to try these 🙂 Thanks! Holy crap! This is fabulous, not only because I adore Spanish-style chorizo in all it’s myriad forms, but because Olympic Provisions just started making it’s own version of chorizo that I’ve been dying to try. What a perfect opportunity! Thanks!